Based in Philadelphia, Samantha ventured into the world of Mixed Martial Arts a few years ago, and it all started with boxing. Her father had put up a bag in their shed for cardio and she began from there. Tired and unhappy, she had gained weight as a result of being static in her chair. After working with her coach and fightTIPS creator Shane Fazen, Samantha became addicted to training and felt her body change. She gained back much of her abdominal function and this inspired her to try to walk again. Walking had seemed impossible only months before. However, boxing itself was not something Samantha ever thought she would be able to do. As she found herself growing in skills and capabilities, she refused to rule anything out. The workouts were fun and challenging, which helped her to realize that a fighter isn't always the conventional idea that others would believe. 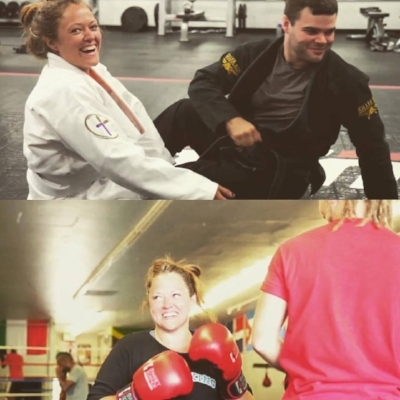 Martial arts literally gave Samantha her life back. No longer okay with the way her life was, she worked hard day in and day out to obtain her goal of walking once more. Her initial frustration and sadness of being in the chair subsided as her passion for boxing and training took over. Samantha's boxing coach encouraged her and shared that he also believed she would be able to walk again some day. This dream is what she held on to through the difficult times. After her father's unfortunate passing four years ago, Samantha vowed to continue pushing herself until she reached her goals. She had already experienced the feeling of being able to do something she never thought she could, and found she was capable of much more than what she had originally believed. Samantha worked at a UFC gym and watched all the training that happened on the floor, including the martial art of Brazilian JiuJitsu. When guests and members came to check out the gym, she was able to explain with ease what the sport was and describe various techniques. It was only natural that she tried it. She had once thought she couldn't box and had already been doing so for the last few years. BJJ was just another thing for her to conquer. 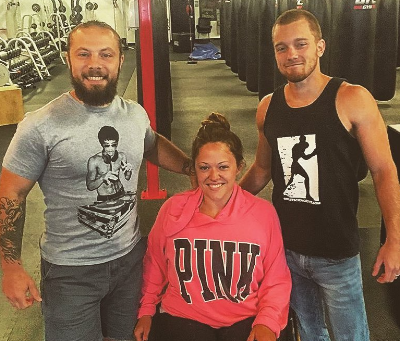 She began incorporating Brazilian JiuJitsu in her training routine this year and it took some time to figure out how to do things without having the wheelchair as support. Brian Freeman, another adaptive athlete better known as Wheelchairjitsu, flew out to help her learn how to manipulate and maneuver her body. After having several years of experience himself as a blue belt in JiuJitsu, Brian was able to teach her coaches how to work with Samantha as well as methods for her training. Adding in BJJ as well as continuing to box and other forms of working out increased her confidence. Samantha found inspiration everywhere, from her coaches to her training partners and friends. She felt as though she had a family within the JiuJitsu community and that she fit right in. As a white belt, it excited her to know that she would be able to compete, similar to how her friend Brian does regularly. 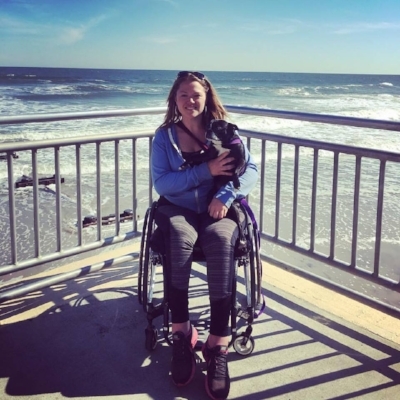 Samantha now trains the two sports simultaneously, which only encourages her to continue on her pursuit to walk again. Last year she began a GoFundMe for Project Walk as a means to achieve this dream. The process behind it is so that Samantha can connect with her nerves and reteach her body how to walk. Currently, her muscles are fatigued and she has no strength in her legs. Stimulating her muscles helps to activate those nerves, as well as utilizing corrective exercises and working on her posture. Stretching is a critical aspect of it, but at the end of the day, the whole process is entirely mental. The facility where she needs to go is one of the most premier spinal cord rehabilitation centers, but they are expensive. With her GoFundMe, she's 1/4th of the way of being able to afford entering the final stages of her recovery. "I want to be the best possible version of myself. I have been doing something athletic for the first time in my life, and I can feel it in my feet that they want to move. All I want to do is inspire other people that they can do whatever they want--you need to work on your mind much more than you need to work on your body." After Samantha's accident, she didn't ever believe she would have a real life again. However, through her efforts in the gym, she has been able to reinvent and empower herself. She watches BJJ every night with her team and finds the martial art to be like a chess game. "If I could walk, I would 100% consider a career in the cage. I would like to do MMA, and I think I have learned so much that it wouldn't be a far reach for me. The community is what does it for me and the family that I have gained as a result of it." Samantha trains several hours a day and focuses on each art with her trainers. She's optimistic about what's coming next for her. A documentary has started filming on her road to getting back on her feet, including her pursuits in martial arts. Originally, she had a 99% chance of never walking again, which has greatly diminished since. Her YouTube channel shows that adaptive athletes are capable of anything and should try to achieve whatever it is they want. "There's not many people in wheelchairs doing Brazilian JiuJitsu, but honestly, JiuJitsu will save your life. I think spreading the word about it and sharing what these beautiful sports have done for me will really empower someone else and show them that their life isn't determined by their circumstances. We make our circumstances and I decide to live my best life." You can follow Samantha's journey on Instagram at @samanth919 and Twitter at @samanthtwining.